Stamping and integral coloring were used to create this look at La Gran Via shopping mall. At the recent Concrete Decor trade show, Jim Peterson, president of The Concrete Network, met Carlos Funes of Constructora Funes. Carlos explained that his father owns and operates a decorative concrete company in El Salvador. Carlos told Jim that his dad is a huge fan of The Concrete Network, and even follows the company on Facebook. The Salvadorian company has more than twenty years of construction experience. They ventured into decorative concrete in 1996 when they first began stamping concrete. 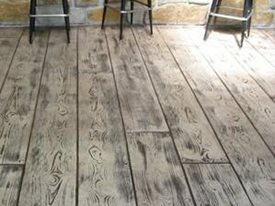 At the time, very few people in their country had seen or heard of stamped concrete. Once Constructora Funes introduced their product to the market, the decorative side of their company expanded. They began offering polished floors, stained in a variety of colors, self-leveling overlays with non-slip texturing, and integrally colored concrete. Constructora Funes is a trained installer of Increte Systems. Increte offers limitless color options and a wide variety of stamp patterns. It is a product that can be used to replicate granite, slate, stone, brick and even wood, while providing the durability of concrete. Stamping and staining makes this concrete floor look just like real wood. Most of Constructora Funes' projects are for commercial clients. They have stained and polished interior floors for appliance and furniture showrooms, as well as restaurants. They also do beautiful stamped and colored exterior work for hotels, schools, and parks throughout El Salvador. The success of Constructora Funes can be partially credited to the Salvadorian government's recent efforts to attract tourists from North America and Europe. Heavy promotion of El Salvador's beaches, nightlife, cuisine, and excellent surfing conditions has led to a push to westernize parts of the country. In the capital, San Salvador, and the coastal areas, decorative concrete has emerged as an affordable and luxurious option for hotels and attractions. 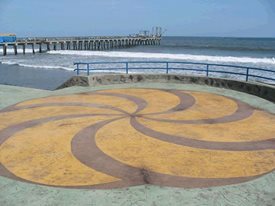 This acid stained radiating spiral design on the boardwalk in Puerto La Libertad, makes a nice stopping point where tourists can enjoy the ocean view. 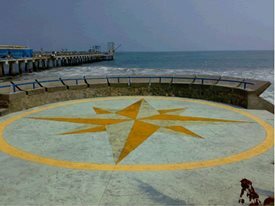 One project Constructora Funes is particularly proud of is their stamped and stained malecon, or boardwalk, in Puerto La Libertad. Puerto La Libertad is an up-and-coming tourist destination, which attracts those who love sun, sand, surfing and seafood. Constructora Funes poured, stamped and stained 39,000 square feet of concrete for the boardwalk. They used a 5' by 5' stamping skin with a Lisbon Granite pattern to achieve a natural, stone-like texture. A variety of acid stain colors were used, including teal, adobe buff, harvest sand, seafoam green, redwood, safety yellow, bronze and terra cotta. The project features two beautiful designs: a large compass, as well as a radiating spiral, both of which serve as markers for viewpoints that overlook the ocean. Crews worked on the project for seventy days, enduring hot weather, blazing sunshine, and gusty winds. However, the end result was worth the challenges. The company's decorative concrete work is already proving to be indispensable in providing a luxurious resort feeling for visiting tourists. 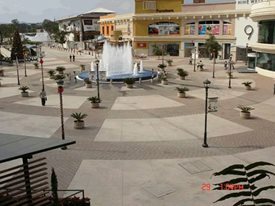 Constructora Funes is a true testament to the worldwide appeal and market for decorative concrete. It is exciting to see companies like this one succeeding around the globe. We hope to see many more in the future.